Metamaterials are a very interesting advanced material. Metamaterial can be described as an electromagnetic composite in which structure and constituent materials determine how it will affect the propagation of light. Metamaterials typically include several classes of electromagnetic composites including photonic crystals, negative index materials, low index materials, zero index materials, and chiral metamaterials. The wavelength or frequency at which they control the propagation of light and therefore energy is a function of the size of the periodic features. For photonic crystals, the feature is on the order of the wavelength of light. For the other classes of metamaterials, the feature size can be 10 times to 100 times smaller than the wavelength of light. In the age of smart phones, in which multi-band operation, lighter and lower profile products are desired by users, metamaterials have finally found a home in the world of mobile phone antennas. Rayspan has successfully commercialize metamaterials by integrating them into antenna applications. Netgear became Rayspan’s first customer. To date, Rayspan has shipped over 25 million metamaterial antennas in routers. LG was the next customer. LG has integrated Rayspan’s low profile, multi-band metamaterial based antenna into the LG Chocolate smart phone. LG’s president notes that this enabled them to achieve a much sleeker product with improved antenna performance. Since, Rayspan has signed a licensing agreement with another undisclosed mobile phone provider. Rayspan’s success at commercializing a metamaterials based product is notable. I led a research program at a large aerospace company for five years in the area of metamaterials. Based on my own experience, I would say that the lack of customer awareness (and customer pull) was the biggest problem. The next challenge was to appropriately match the class of metamaterial to a targeted application area. I took into account the maturity of metamaterial fabrication and design and the absorption of the metamaterial and the constituent materials. Finally, the metamaterial would need to be matched to the appropriate application. Specifically, the integration of the metamaterial would need to enhance various desired performance characteristics one to two orders of magnitude. 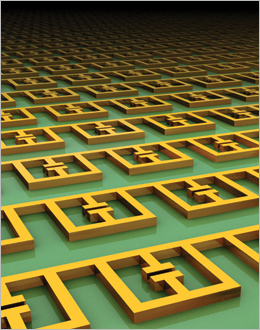 Metamaterials have the potential to transform the current technology landscape in several industries. Future posts will discuss advances in the design, fabrication and integration of metamaterials into applications.